I am a new media artist with focus on dance and technology. I believe in new media as a powerful means to achieve artistic integrity and clarity in creative works. My interests include: theatrical presentation of new media - "Performable Media", body in transition of virtual and physical space, and development of media poetry. My works on multimedia / dance have been presented at IDAT (Arizona), Biennial Symposium on Arts and Technology, Performance Studies International Conference, MIT/CalArts Collaboration of Wearable Technology, LA Woman¹s Theatre Festival, American Dance Festival, Philadelphia Fringe Festival, Festival of Solos and Duets, UCLA Hammer Museum, Los Angeles Contemporary Exhibition (LACE), Los Angeles Arts Open House, the HK Independent Dance Series, the Highways (Los Angeles) , and among others. My video works have been screened in Spain, Italy, and the US. Also, I was member of Trip Dance Theatre and Bridge Dance Theatre in California. 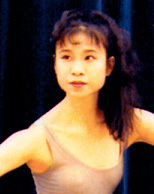 My education background includes MFA in Integrated Media / Dance program from California Institute of the Arts, BFA in Dance from the Hong Kong Academy for Performing Arts and teacher¹s certificate from Beijing Dance Academy. I am recently a lecturer of School of Creative Media at the City University of Hong Kong. Before that, I served as multimedia designer in Los Angeles. Project Interests: At this moment, I am exploring media dance poems. The idea is to experiment with different possibilities to integrate certain performable media as theatrical presentation with emphasis on body movement, text, time and space. Some related words: Body ­ instrument of human expression, energy, shape, presence, absence. Text ­ context, syntax, text as image vs. image as text, visual & audio transformation of text. Time ­ interactive, linear, non-linear, stillness. Space ­ physical characteristic, virtual interaction, alternative perspectives on spatial use. In the Interaktions- Laboratory, I wish to be involved in collaborative projects with artist and technologists and come up with some performance ideas. I started to use a computer application I created before, called "Keyboard dancer", which would transform text into dance sequences interactively.